Elusive Badge! is the sixteenth Trouble Center mission in Paper Mario: The Thousand-Year Door, initiated by Ms. Mowz (identified as ??? in the Trouble Center). Mario and co. must head to the rooftops in Rogueport Square, where Ms. Mowz will tell Mario of an "elusive" badge in Hooktail Castle. Mario must head back to the place where Hooktail was defeated and obtain the Attack FX B badge by using Flurrie's ability in the center of the area. 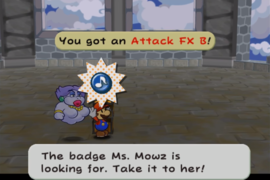 Once the badge is found, Ms. Mowz will join Mario's party, thus completing the mission. The badge cannot be found in Hooktail's lair before taking on Ms. Mowz's trouble. "I'm after an elusive badge. Must explain in person. Meet me on the roof of Zess T.'s house in Rogueport Square." This mission is unique in that Goose warns Mario of the anonymity prior to starting the mission. The chapter names provided for the missions indicate the chapters that must be completed in order for said missions to be unlocked. Need a Key! • Safe Delivery... • Price Adjustment • Find this guy! • Hit me, please! • I'm hungry! Try to find me! • Listen to me! • Order me an item! Emergency Shroom! • Play with me! • Help my Daddy! Help Wanted! • Heartful Cake Recipe... • The food I want. Elusive Badge! • Newsletter... • Seeking Legendary Book! Tell that person... • Looking for a gal! Delivery, please! • I can't speak! • I wanna meet Luigi! Roust these cads! • Help me make up. • Erase that graffiti! This page was last edited on July 5, 2018, at 12:38.